Men gather on Wednesday mornings at 6 a.m. for teaching, small group discussion, prayer and fellowship. Coffee and donuts or biscuits are provided. The focus for fall 2017 is the Goliaths in our lives – things that taunt us, harass us and try to keep us from experiencing God more fully, such as fear, need for acceptance and addiction. CLICK HERE to follow the men's "LiveUp" blog and learn more about the men’s ministry, or email Richard Illges. 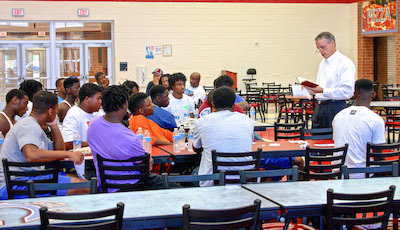 CCC serves a weekly dinner to the Carver High School football team in season. At least six volunteers are needed each week, and more are encouraged. With a larger volunteer turnout, men who aren't serving dinner are free to spend quality time with the team's players, coaches and support staff. Dinners are served the day before game day, with setup typically beginning at 5:15 p.m. and dinner ending around 6:30.